Today I have a card to share that I made for the upcoming wedding of a friend of mine. My first attempt at a shaker card was rough. But I had an idea for one and thought I would give it a try again. I'm happy to say this one was much easier and I like the results much better. For this card I die cut the front panel using the largest rectangle in the Large Stitched Rectangles die pack from Lawn Fawn. Then I ran the card stock through again using the Stitched Hearts dies from Memory Box. I used some spare transparency sheets to make the window in the large heart. To attach the transparency behind the card front I just used Scor-Tape. The tape is really strong and I can rip it and place it where I need to. Next I lined along the edge of the heart on the back of the panel with Scotch foam tape. I placed more foam tape around the rest of the panel so it would pop up from the card base. Before attaching it to the base I added white and silver sequins. For the base I wanted a little color to show through, so I used Pink Pirouette card stock from Stampin' Up! 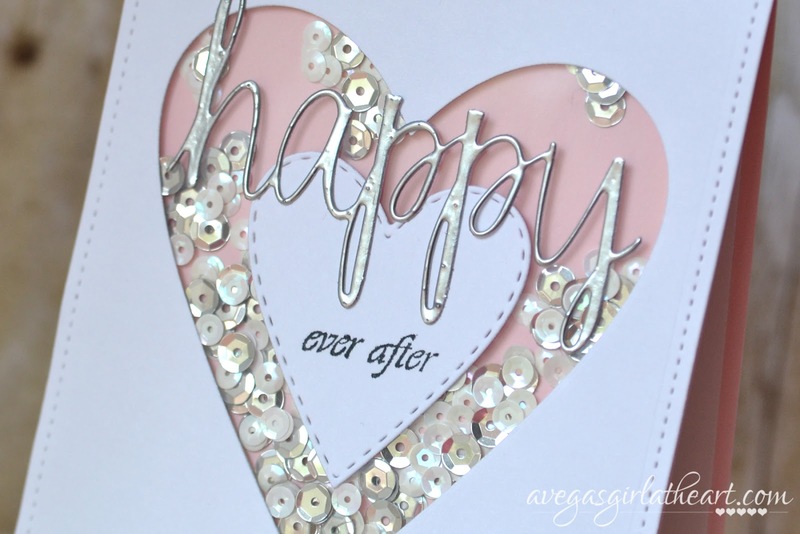 On the front, first I stamped 'ever after' with an older Hampton Art stamp I had onto the smaller of the hearts. I just colored those words only with Tuxedo Black ink, stamped it, and then attached the heart to the front of the transparency panel. 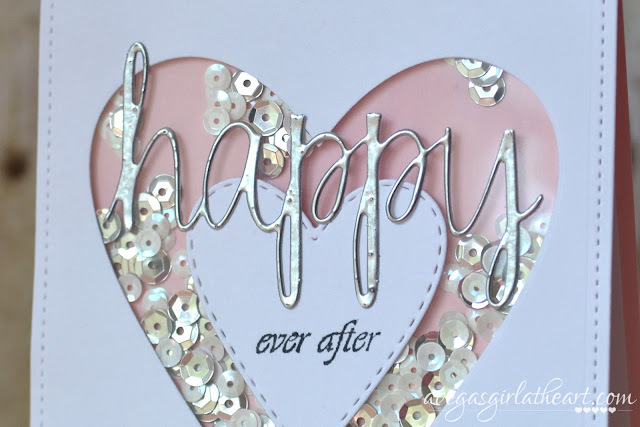 I die cut the 'happy' using the Avery Elle Simply Said Happy die. Before die cutting I used an adhesive sheet from Sizzix to add adhesive to the back of the card stock, which made it easier to attach to my card later. I temporarily adhered the die cut to a sheet of card stock, then stamped all over it with Versamark, and added Stampendous Sterling Silver embossing powder. I heat embossed it, carefully peeled off my die cut, and added it to the card front. I hope my friend likes this card! I actually had a lot of fun making this shaker card, so I feel much more confident about making more of them in the future.